Adobe’s February 2019 TechSummit delved deep into the future of technology and helped Adobe staff forge new connections. 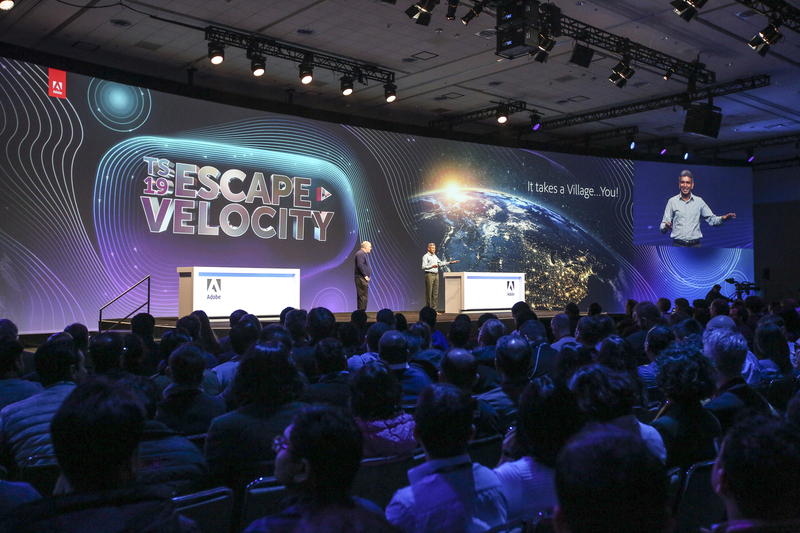 Rallying around the theme of “Escape Velocity,” the conference took place in San Francisco earlier this month, with more than 3,000 Adobe researchers, engineers, designers, and developers coming together from across the globe. This year’s TechSummit was the largest ever. Many from Adobe Research participated in the event as organizers, speakers, demo and poster presenters, and award winners. Those included Jianming Zhang, winner of a Tech Excellence Award, and Scott Cohen, winner of a TechSummit Shark Tank challenge. Gavin Miller and Shriram Revankar were sponsors of the event, and Eunyee Koh served as Technical Program Chair. Those who presented on the main stage also included Hailin Jin, Holger Winnemoeller, Zhaowen Wang, Christopher Tensmeyer, Tak Yeon Lee, and Fan Du. Other staff led sessions and technology stations, including AR/VR experiences and a unique 3D face photo capture technology from TJ Rhodes and Bhautik Joshi. Employees created art and films for the event, and Claire Li served as Chair of the TechSummit Film Festival. The first Adobe TechSummit took place 25 years ago in 1994. It was designed as a way to bring newly merged engineering teams together to learn from each other and to plan the future of technology. Because of the state of the business at that time, it was almost entirely developer focused. As Adobe has grown in a number of new directions since then, including research and services, TechSummit’s role has expanded. It has remained, however, a conference focused on the technical minds that make Adobe’s products possible. The event is organized every two years. This Adobe Life blog story offers some key takeaways from this year’s TechSummit. And check out this video to catch a glimpse of this event celebrating and energizing Adobe’s cutting-edge work.